Rising from stones at the end of the Marblehead peninsula, the Marblehead lighthouse is one of the most photographed landmarks in Ohio. Built in 1821, it’s also the old lighthouse in continuous operation on all of the Great Lakes. 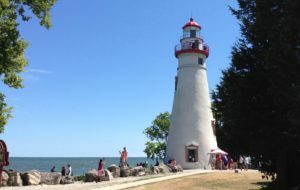 The lighthouse is surrounded by picnic grounds, a museum in the old Lightkeeper’s House and a Lifesaving Museum in a replica station, all in an Ohio state park. The lighthouse, Keeper’s House and Lifesaving Museum are open noon-4 p.m. daily, Memorial Day through Labor Day. They are also open the second Saturday in October for the Lighthouse Festival (9 a.m.-4 p.m.). Cost to climb the lighthouse is $3 cash for adults and children ages 6 and up. Children under age 6 are free. Museums are free.